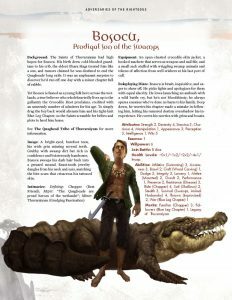 Now available in PDF from DriveThruRPG: Adversaries of the Righteous: Bosocu, Prodigal Son of the Swamps for Exalted 3rd Edition! The Saints of Thuvaraiyam had high hopes for Bosocu. His birth drew cold-blooded guardians to his crib, the eldest Ghara Hags treated him like a son, and rumors claimed he was destined to end the Quagheads’ long exile. It was an unpleasant surprise to discover he’d run off one day with a minor chapter full of rabble. Tattooed thugs and honor-bound heroes, shiftless anarchists and romantic wanderers — the Crocodile Knights are called many things across the wetlands up and down the Grey River, and “Quagheads” is among the more polite. They rove between villages on crocodile-drawn watercraft, unload illegal cargo and intriguing boasts at every stop, and adhere to an opaque charter of strict taboos. The demon realm of Malfeas lies wholly apart from the mortal world, subject to its baleful masters’ whims and never graced with the orderly presence of Creation’s elements. Instead, its cracks ooze with Theion To, or vitriol: the acid of Hell. 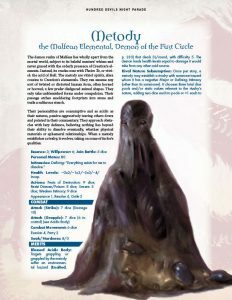 The metody are vitriol spirits, alien cousins to Creation’s elementals. They can assume any sort of twisted or distorted human form, often horned or hooved; a few prefer disfigured animal shapes. They only take unblemished forms under compulsion. Their passage etches smoldering footprints into stone and trails a sulfurous stench. Aaron Rosenberg and Lauren Roy’s recent Exalted novel, False Images, is now available on the Amazon Kindle and on B&N Nook! Unfortunately, we discovered an error in Dragon-Blooded, and so were unable to put it up for sale this week as planned. While we weren’t able to catch it in time for today, it should be fixed in time for a release next week. Our Kickstarter for a prestige version of the upcoming Contagion Chronicle crossover chronicle for the Chronicles of Darkness started yesterday! We currently have $37,508 of our $50,000 goal, or 75%, with 718 backers. We’re doing well so far, and are looking forward to the month ahead! ◀ The Contagion Chronicle Kickstarter has launched!